A new tube amplifier on the market ! Built in the form of two monoblocks, of a classical “vintage look”, but at the same time incorporating modern technology, which is hidden under the deck. 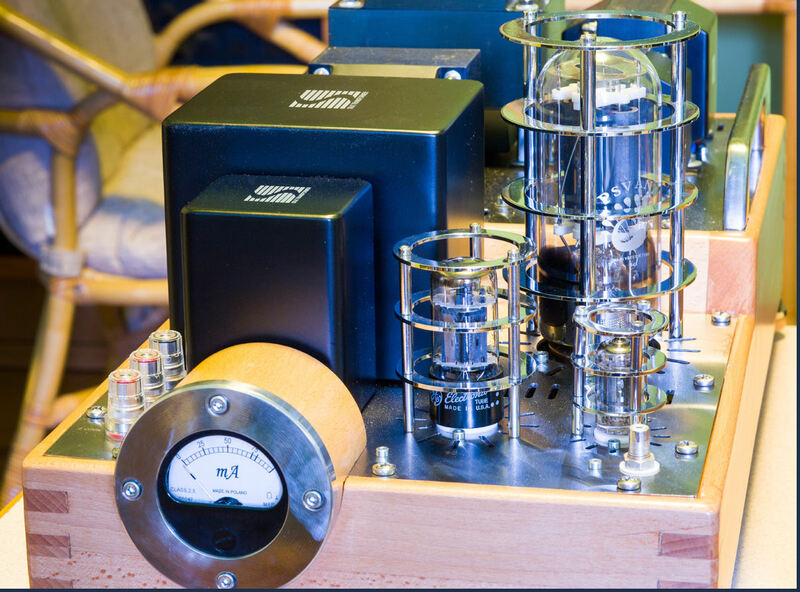 Under this laser trimmed stainless steel chassis, with glittering tube protections, you can find modular solid state PSU units, located at the back, and a ‘point-to-point’ soldered amplifier, based on a pair of Psvane 845 T-collection tubes in the front. The power tubes are connected with a potted, hand-wound OPT, made by SAC Thailand, to match the high tube impedance with 4Ohm / 8Ohm loudspeaker boxes. 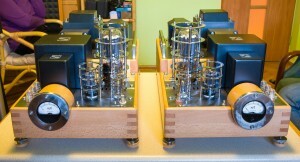 The 845′s are driven by well-known 6BX7 triodes, these loaded by hand-wound wide-band plate chokes, also made by SAC Thailand. Together with a set of grid chokes (from the same manufacturer) this combination enables the power stage to work in Class A2. The first stage is an SRPP, equipped with 5687 Tung Sol triodes. 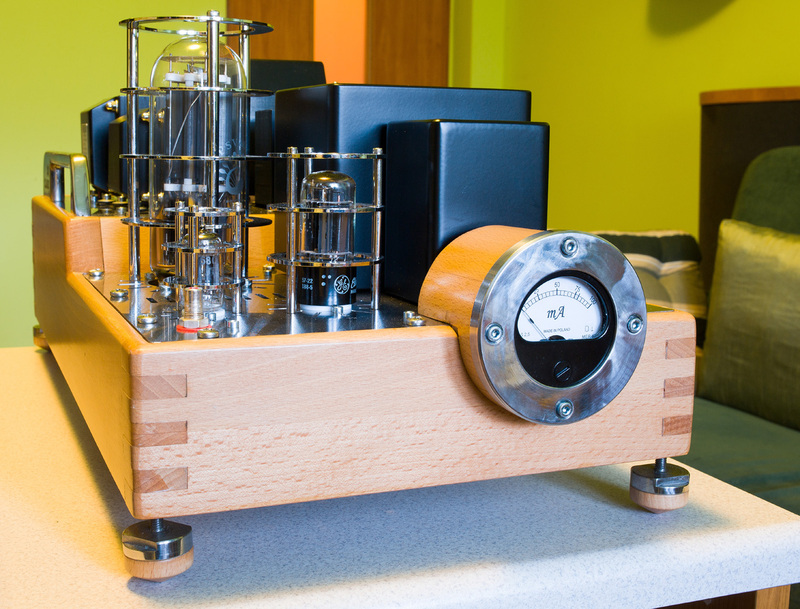 The PSU unit, with EDIS irons and lots and lots of ‘uF’ in its high voltage capacitors, is responsible for the highly dynamic sound of the gear. 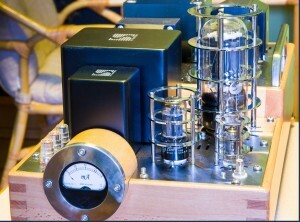 The amplifier has a typical glass sound, with strong mid-range and wonderfully clear high tones. The bass is extended well down, but stays a little bit behind the rest of the acoustic scene. With loudspeakers of an efficiency of 86dB/1W, the noise floor is not noticeable. The experienced audiophile will appreciate such a musical performance. Now, a few words about specification and features. At a mains voltage of 230VAC, the RMS power is 18W at 4 / 8 Ohms, with a bandwidth up to 33kHz (-3dB) and 52kHz (-6dB) respectively. The power consumption is 155W/unit. The weight: 58 lbs/unit. The gear is available for audition in Poland, in the Katowice / Cracow region. ( Created by J_S ).